On Deepavali Day, both me and my husband were free and jobless for a day.. 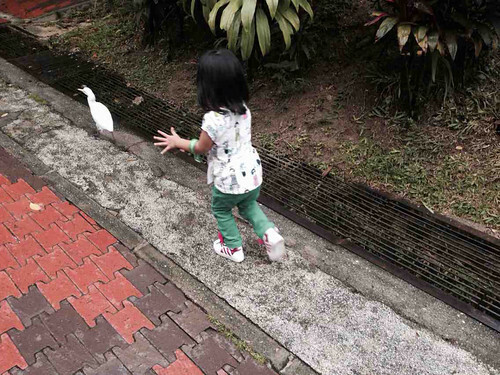 So, my husband decided to bring the children out to the Bird Park near Lake Garden.. Yay! I love family outing. It is so nice to get to bring the girls out and let them enjoy nature. Well, it's KL, where to find trees and birds and all? So, Bird Park is definitely a good idea..
We left after feeding Tasha for lunch, and let Bella has something light at home first..
Bella was bored while waiting for the food.. and Tasha was ready to eat the menu.. After we had our lunch, off we go into the 'jungle in the city'..
B super excited seeing a peacock.. she actually chase it around until the peacock disappear in the bushes..
Kesian burung tu kena kejar dgn Bella.. 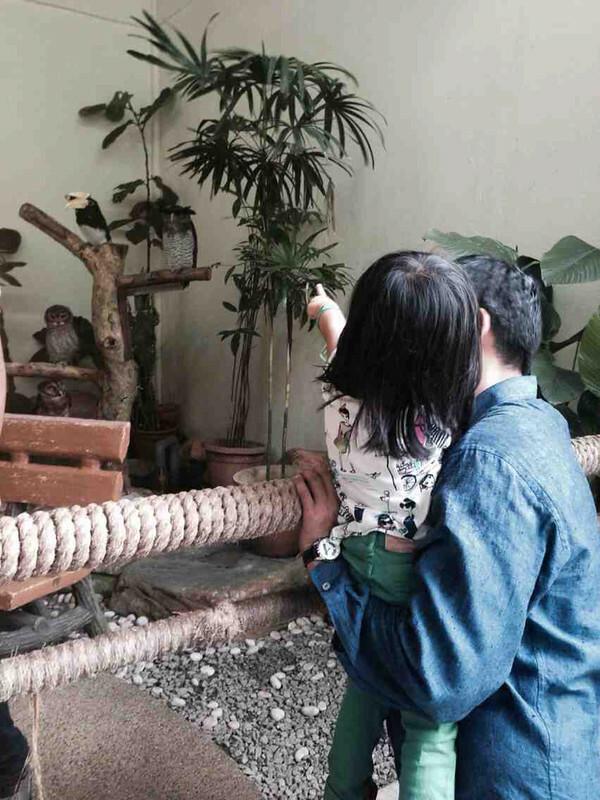 Observing some exotic birds.. What excites her was the owl..
She bugged her dad to lift her up until she finally get hold of the chic herself..
Memang berani.. She loves the chic so much and not letting go… Hahaha.. poor chic! And that's Tasha, doesn't really understand what she's looking at but giving us her best I'm-really-enjoying-this face.. 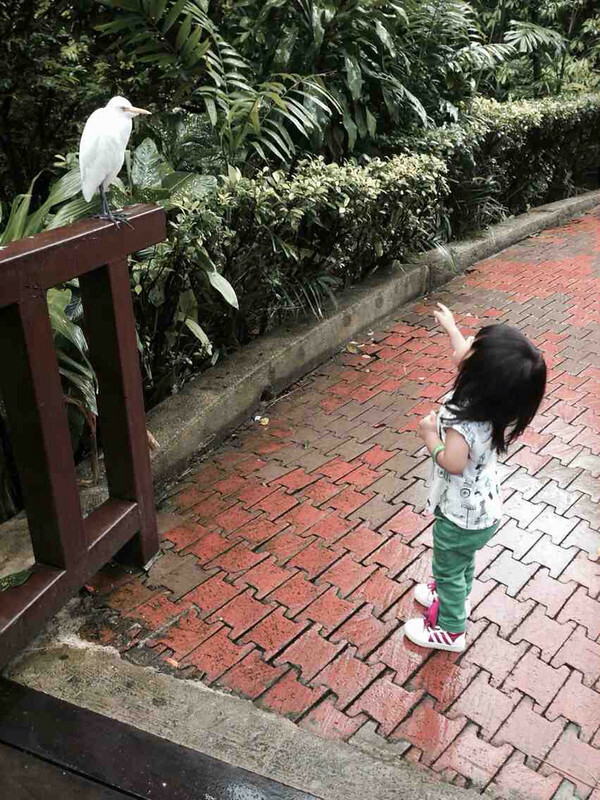 I guess she's having fun looking at the birds flying around their big cage..
And Bella, kept wanting to touch the parrots.. No fear at all! 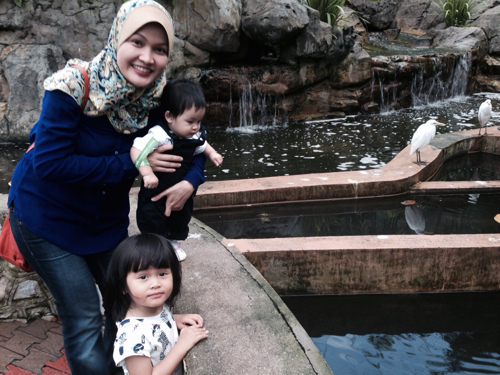 Mommy yang takut dia kena patuk..
Posted on November 3, 2013 November 3, 2013 by Dr Halina Mohd YunosPosted in FamilyTagged outing. Previous Previous post: Wonder Woman!! Next Next post: When a Rooster Crows..
sounds fun. maybe i’ll bring my girls there nxt week. B can be a vet when grow up. T is super cute. wow!!! 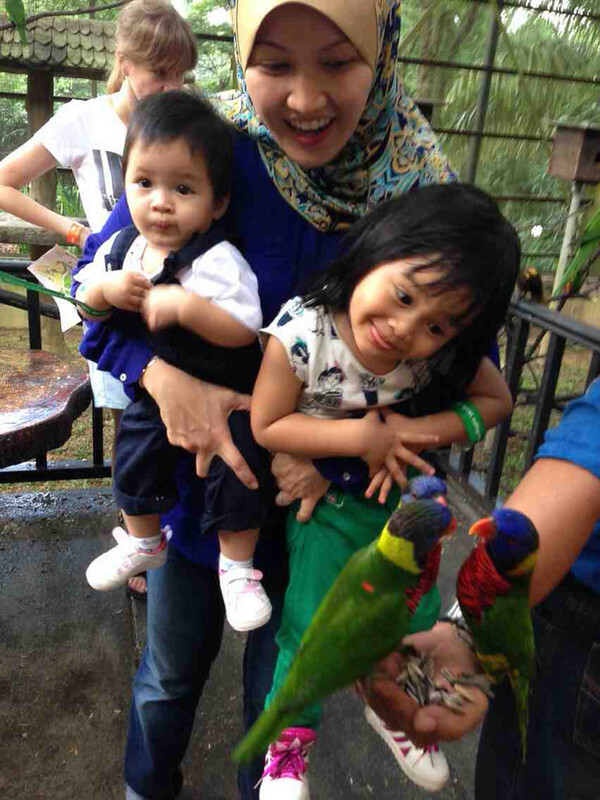 happy family…..tasha x pegang sekali ka parrots tu…?? Beraninya B..! saya yg umur 21 pun takut nak pegang anak ayam tu.. haha! bagus2! Anyway, both of your little girls are cute. Can’t wait to have mine too! loves to see ur children dr! Cuti lar time nak bawak anak2 keluar.. Tak sempat nak penat!! I can see B had so much fun. 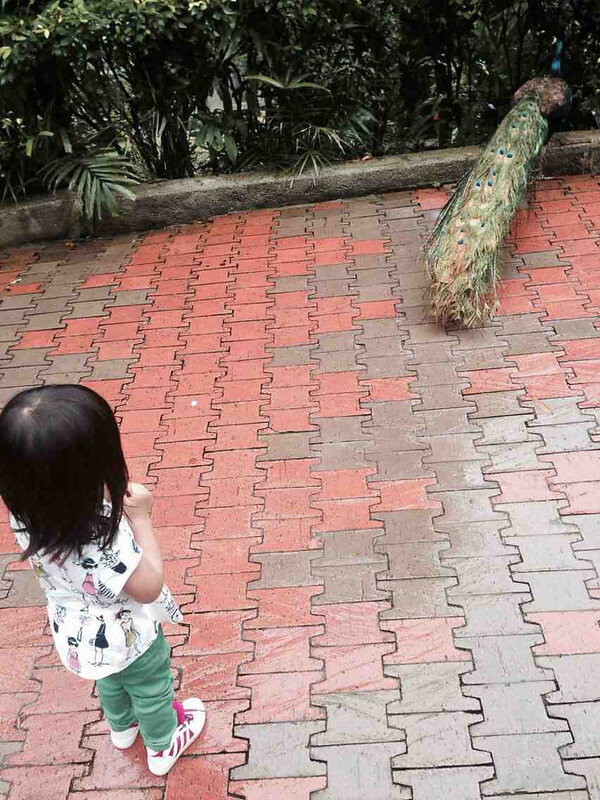 I brought my triplets couple months ago to bird park n they love it! 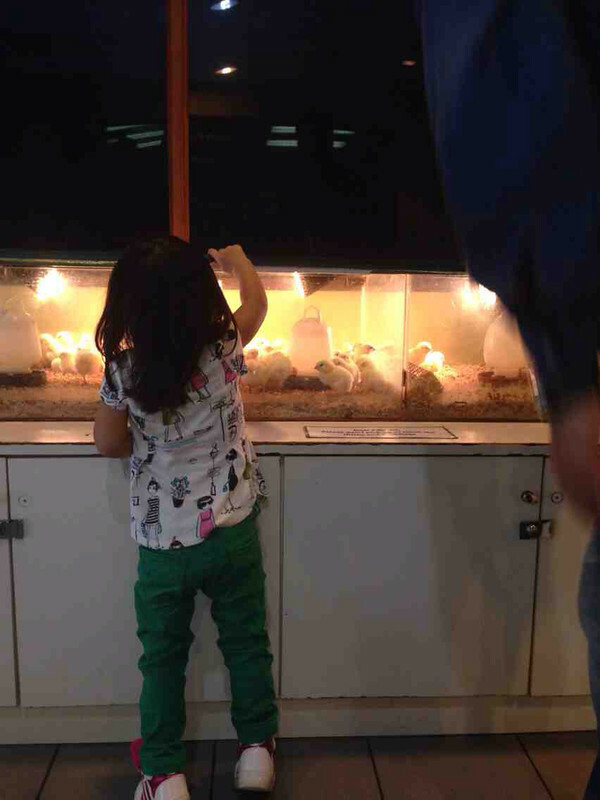 Next destination perhaps u can bring them to butterfly park or Farm in the city at seri Kembangan .. I bet B will loveeee it!!! Dah nama pun Farm in the City.. Manader gajah ngan zirafah dlm farm!! Anyway, thanks, will check that out! Doc, do u take spicy food during BF ? I am a fan of cili padi tp since i was BF i scared to take spicy food.. Is it ok for us to take spicy food while BF? Btw my son only 2month old.. I didnt really take spicy food during breastfeeding ..
looking at the 1st pic. …bella seat like a bosss!! Hehe…..
macam comel je, macam comel je! hahha..that was such a fun day, doc! do keep those writings coming in ya! 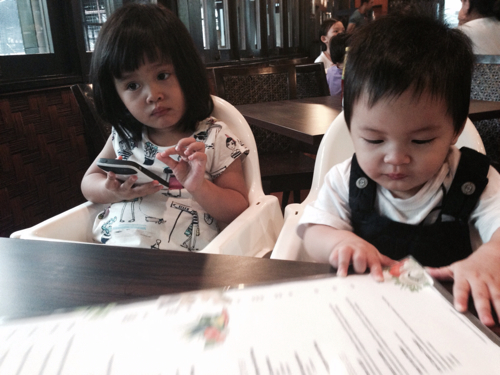 sukeee sgt baca ur blog! 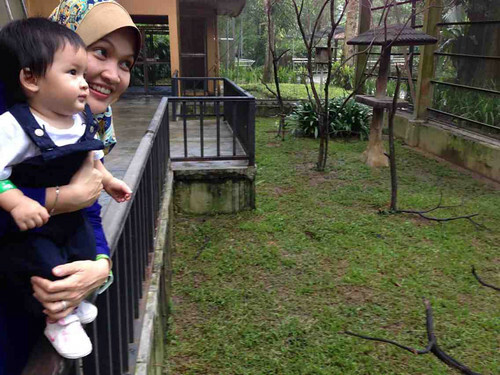 bagus la bella..mesra binatang..berjiwa penyayang ni..Dr boleh buat mini zoo di rumah untuk B..
dr..anak sy pernah pegang anak ayam sampai mati anak ayam tu…hihi..
Bagusnya Bella! Berani betul. Nasib baik tak ‘remuk’ anak ayam tu 😀 And Tasha, as usual, memang comel sungguh! Bella seems very enjoyed with animals and nature.